Ga-doped Li7La3Zr2O12 (Ga-LLZO) is a promising solid electrolyte because it shows higher Li-ion conductivity than LLZO doped with other cations. In this work, Ga-LLZO was prepared by a conventional solid-state reaction and sintered in ZrO2 crucibles to avoid introducing Al into the samples. The particle size distribution, phase structure, morphology, ionic conductivity, and bulk density of the samples were characterized by laser diffraction particle size analyzer, X-ray diffraction (XRD), scanning electron microscope (SEM), AC impedance, and Archimedes method, respectively. 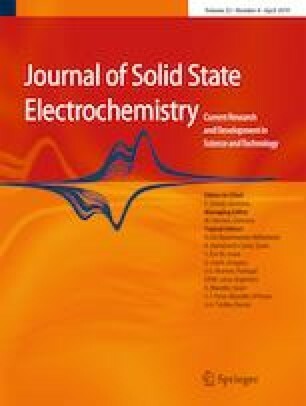 The effects of sintering temperature and dopant content on Li-ion conductivity and density were investigated. As for Al-free Li6.4Ga0.2La3Zr2O12, the Li-ion conductivity and bulk density are improved with the sintering temperature rise. But when the sintering temperature is 1250 °C, the Li-ion conductivity and bulk density decline. As for Al-free Li7-3xGaxLa3Zr2O12, the tetragonal phase disappears completely when x ≥ 0.15. The Li-ion conductivity and bulk density of Al-free Li7-3xGaxLa3Zr2O12 are improved with an increase of x (x ≤ 0.2). The ionic conductivity of Al-free Li7-3xGaxLa3Zr2O12 sintered in the air by liquid-phase sintering is close to Ga-LLZO sintered in dry O2 atmosphere. Li6.4Ga0.2La3Zr2O12 sintered at 1200 °C shows the highest Li-ion conductivity of 1.5 × 10−3 S/cm at 30 °C, and the activation energy is about 0.28 eV. The authors acknowledge the financial support from the National Natural Science Foundation of China (51374055).